As a scientist, you know your world is about to change when your boss, the government and the international media are all suddenly on the phone asking for answers. 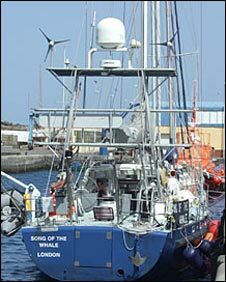 That was the lot of whale biologists and veterinary scientists in the Canary Islands on 24 September 2002 - a date that may go down as one of the most significant in humankind's long history of interactions with whales. "There was already some news that many animals were stranding along the beaches of Fuerteventura and Lanzarote," recalls Antonella Servidio. "Most of them were still alive and people on the beach were taking care of them with towels, trying to make them comfortable; but they were already in a very bad condition. "On the beach were many tourists, the press were already there, we were receiving phone calls every five minutes to know what was going on; it was a really tense situation." What made it especially tense - and the tensions have not fully subsided, six years on - was that over the bodies of dying whales, the tourists and the locals and the press could all see the flotilla of warships assembled for the Spanish navy's Neotapon 02 exercise. The Society for the Study of Cetaceans in the Canary Archipelago (Secac), for which Ms Servidio works, scrambled to co-ordinate the collection and study of the dead and dying animals. 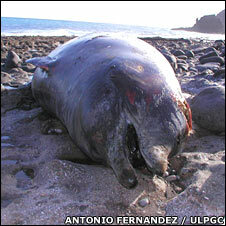 Beaked whales - for they, and only they, were stranding - are big creatures, up to seven metres (23ft) long and three tonnes in weight. 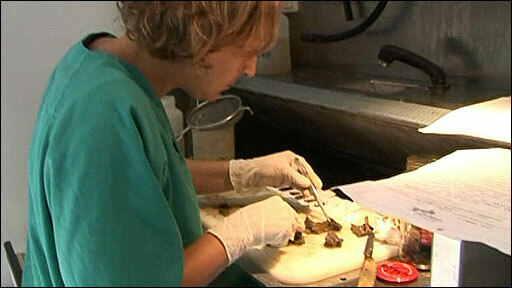 And yet speed of collection was vital, otherwise decomposition could overwhelm indications of what killed the animals. So for the most part, scientists cut off the heads and other bits of tissue likely to be of interest and brought them to local laboratories for autopsy. Six of them ended up in the Veterinary School of the University of Las Palmas in Gran Canaria, which had already made a specialism of studying marine mammals - hardly surprising when the school is just 300m (1,000ft) from the sea. What Antonio Fernandez's team found when they dissected the whale heads would eventually transform the use of military sonar in Europe and the US. "What we found in the micro-vasculature (capillary blood vessels) was that gas bubbles and fat were working there as foreign bodies, blocking the cardiovascular system," he says. "Obviously these foreign bodies were blocking the small vessels, breaking them and inducing haemorrhage." Not only was this seen in the six whale heads, but the same signs turned up in the liver, kidney, spleen, lungs, pancreas and lymph nodes of the whales examined intact. Environmental groups said it proved that military sonar used during the exercise was driving the animals to their death. The military said there was no proven link. The Canaries are a popular venue for naval exercises, partly because the seabed slopes quickly downwards from the islands, with deep canyons that enemy submarines might presumably use for concealment. Nato was back in the region for Majestic Eagle in 2004. 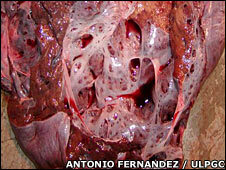 Within days, Dr Fernandez received four dead beaked whales, all showing the same signs of fat embolism and haemorrhage. Further naval manoeuvres two years later in the Mediterranean coincided with beaked whale strandings along the coast of southern Spain. Evidence was also coming in from other areas of the world, such as US Navy testing grounds around the Bahamas and California. For the environmental movement, the case was proven beyond doubt. But for scientists, key questions remained. If military sonar was driving beaked whales to strand, why was it happening? Why did it only happen to these reclusive species, while others such as sperm whales, pilot whales and orcas appeared to swim through unaffected? And if sonar needed to be restricted, what areas should those restrictions cover? Knowledge gleaned from animal studies is these days routinely used to inform human medical science. The reverse is less common. But here, researchers realised that what they knew about a human condition could be very relevant to what they were seeing in whales. "We think it's a syndrome of decompression sickness, rather like human divers contracting 'the bends'," says Paul Jepson from the Institute of Zoology in London, who co-ordinates the study of strandings around the UK. 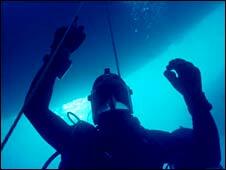 Divers contract "the bends" when they surface too quickly. Pressure on the body reduces as they ascend, allowing gases dissolved in the blood - mainly nitrogen - to come out of solution and form bubbles. But is it conceivable that species that have evolved over millennia to be deep divers - and species that do not inhale as they go down, unlike human divers who must - could suffer from such a condition? Computer models built to allow human divers to operate safely were adapted for what people knew of beaked whale physiology and behaviour. Meanwhile, data on how whales dive was coming in from a new variety of tags that US scientists had developed. 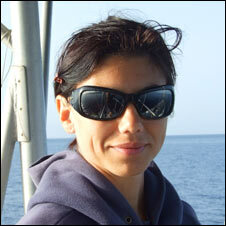 Attached to the whales' bodies, they showed a complete "dive profile" - descent time, dive duration, ascent time. Putting all this together showed, says Antonio Fernandez, that beaked whales might indeed contract their version of the bends. "The dive profile is different from the sperm whale and the pilot whale, other deep-diving species," he relates. "They go down just as fast, but they come up much slower; and when they reach the surface they go into this pattern of shallower dives - 400m, 300m, 200m - and our interpretation is that they need this, and if they break this dive profile they can enter in a risky situation, into a decompression-like sickness." No-one knows why beaked whales need these shallow dives, but presumably it has evolved for a reason. There is a rival theory - that sonar acts directly to cause bubble formation in fat and blood - but the theory also suggests that whales would need to be really close to the sound-generating ships for this to happen, which makes Paul Jepson believe the behaviour modification link is probably correct. "Military sonar systems tend to use frequencies around 1kHz to 5kHz," he says. "And that may be close enough to the sound of a killer whale to disturb the animals and make them change their diving behaviour - particularly in young animals that haven't learned how to distinguish ocean sounds so well." In August, after a lengthy legal and political wrangle, the US Navy - which runs its own research programme on marine mammals - struck a deal with conservation organisations that restricts its use of low-frequency sonar to certain regions and certain seasons. Those same conservation groups are still pursuing restrictions on the mid-frequency systems identified by Paul Jepson as likely to be causing beaked whales the greatest distress. "Now, in the Canary islands, they cannot do any kind of naval manoeuvres, they have to do it outside," says Antonella Servidio, who is sailing this week with the Song of the Whale research vessel for a programme designed to study beaked whales more closely. She says it is not a perfect solution; whales could be damaged in other areas close by and drift, dead, to the islands. A bigger issue, though, is that unless we know much more about beaked whales' habitats and behaviour, it is impossible to know for sure where it is safe to deploy these military sonar systems and where it is not. And an even bigger one is that sonar systems can account for only a tiny proportion of the world's total number of whale strandings. The latest evidence suggests, for example, is that it was not involved in the recent dolphin stranding in Cornwall, which Dr Jepson is shortly to investigate; and it cannot explain what some researchers term "normal" strandings, where big groups of apparently healthy cetaceans beach themselves. It may be something that the animals have always been prone to, perhaps unwanted consequences of their familial ties or vigorous vocalisations. Do other forms of ocean noise, from shipping or mineral exploration, make it worse? And how serious is ocean noise as an issue compared with climatic shifts, entanglement in fishing gear or disruption of habitat? Despite the answers from the laboratories of Gran Canaria and the US courts, big questions remain, as they do over many factors affecting the world's whales.